I remember back when I was first trying to figure out what to e-commerce system to use for my clothing website. There were so many different carts and information out there it was hard to make a decision. It was paralysis by analysis. I’ve since become a web developer working with many clothing companies and using a lot of different carts. With the e-commerce solutions I tried I was always unhappy with something. Either it was the interface, there weren’t enough features, or it was just too difficult for a my clients to run on their own. I was constantly searching for something better that had everything I wanted. Finally I discovered shopify and it had everything I wanted. There are many reasons why you should use shopify, but here are the most important. The biggest reason you should use shopify is that it’s easy. You don’t need to be a techy person to use it, and you definitely don’t need to pay an overpriced webmaster to make the changes you need. This means you’re in control of everything; adding products, blog posts, controlling inventory and managing every aspect of your online business. It doesn’t matter if you are just starting a new online shop, or you have been in business for a while, the last thing you want to do is troubleshoot technology. With shopify you don’t have to worry about updates, SSL security certificates, optimizing your site and host for speed. All of these things are a huge headache and It’s all done for you so you can concentrate on whats important… Running your store and making money. Shopify has over 100 beautiful and professional free and premium themes that will make your brand stand out. I suggest everyone starting out to use a theme instead of a fully designed website by an expensive web designer. The reason is because you want to start testing your ideas out as soon as possible with as little money as possible. The themes in shopify will make you look professional without breaking the bank, so you can get your site up and running and get the ball moving. Add your logo, make a few changes for colors and fonts, and you’re ready to start selling online. 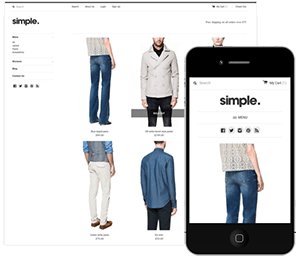 All of themes for shopify are responsive which means your site will look great on every screen size, mobile phone, and tablet. With 50% of your customers coming from mobile devices you need to have a site that looks good on all devices or you’re losing customers. Shopify has over 1,500 free and premium apps and most of these are focused on making you more money. Retarget app: it shows the products your customer looked at in their facebook feed converting users that viewed your site into customers. Beautiful abandoned cart emails app: it will send emails to the customers that abandoned their cart. Both of these apps I’ve seen at least a 10 times return on investment. So for every $1 you spend you sell $10 worth of product. The great thing is once you set it all up they run automatically so you are converting users into customers all day everyday, just sit back and relax. My last favorite thing I wanted to tell you about shopify is that it is constantly improving with more awesome apps and themes being developed everyday. It’s like having a team of 1,000’s of designers and developers working for you but at a fraction of the cost because they are spreading the cost onto everyone that purchases there theme or app. Shopify is currently powering over 325,000 online shops and has helped businesses process over $24 billion worth of sales. The true test is trying it out for yourself to see why shopify is the best choice for running your clothing lines e-commerce store.